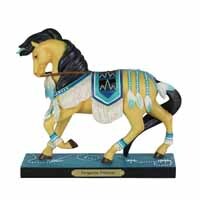 Turquoise Princess | Painted Ponies Everyday Figurines | One Price Low Flat Shipping! From the Trail of Painted Ponies Winter 2019 Collection, Turquoise Princess Native American Horse Art Figurine. Designed be acclaimed equine artist, Lorna Matsuda. Made of stone resin. Measures 7" tall. Comes in collectible box with story card. Tales say Native Americans noticed gray rocks with clear blue lines and interpreted them as elements of sky and water. From then on, turquoise was cherished for beauty and a source of healing energy and good fortune for those who possessed it.